When it comes to SEO it can be tricky and can take a while to learn the best way to optimise your content. One of the best tools that we’ve found for helping to get a handle on SEO (if you are WordPress user) is Yoast SEO for WordPress Plugin. It works on a “traffic light” system in that each parameter for SEO is ranked according to green, amber or red. Let’s use the example below to show you how it works. 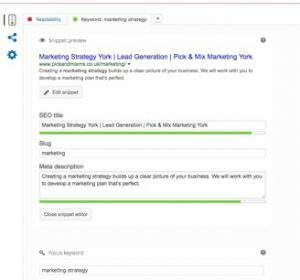 Here is an example of the Yoast results from a the marketing strategy page on the www.pickandmixms.co.uk website. Underneath this section, you will see the analysis breakdown. This break down shows the traffic light system. You can see from the list below there are a couple of elements still showing in red or amber for this page that we need to work on. There is lots more to SEO other than this so please remember these are just quick and easy ways to optimise your blog for better traffic. If you need support with your WordPress website please get in touch with us on 01904 863511. If you do just one of the quick blogging tips that the Yoast Plugin suggests for you, it will improve your SEO and potentially your traffic. 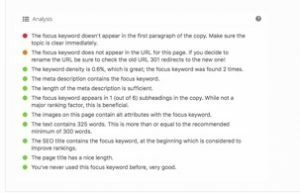 Of all the quick blogging Tips, this is perhaps the most important to help you get basic SEO sorted. Good SEO = Good Organic Traffic. There’s one thing about headlines. They can often be made better (and there are some great tools to help you do it!). One of my favourite headline tools is CoSchedule’s Headline Analyzer. This tool helps you to get more traffic out of your headline by making it more eye-catching and appealing. All you need to do is enter your headline and you will be given rankings for: structure, grammar and readablity of the headline you submit. To find out more about these, check out CoSchedule’s post here. CoSchedule will keep your previous headline results so then you can go back and pick the best result and use it! Always add a shareable image that works across at least one of your key social media platforms. We use landscape as it looks good at the top of the post but it also shares well to Facebook and Twitter. We add this image to the “preferred image” in the Yoast SEO Plugin as well. There’s a social media section on the plug-in that allows you to choose the featured image you want to be shown when someone shares to Facebook or Twitter. Make sure you have Google Analytics installed and check it regularly to see what posts are sending you the most traffic. Look Carefully at the most popular posts. How can you improve those posts? Can you add more shareable images? Can you make them better? Do the stats or references need updating? Add an added value element to the posts that are doing well already so you can capture more leads/subscribers. See point 5 below. Turn these posts into a series of posts – Once you know which topics your readers are most interested in, create more posts about the same topic and link between the posts. This way you can keep them on your site for longer. Add additional content – either via a fact sheet, cheatsheet or free download or checklist related to that particular blog post content. Visitors to your site then have the option to get “more” value from you. To enable people to download these documents ask them to fill in a simple data from so you have their name and other information that is relevant to your business. Make sure that you provide more value (and wow them) after they subscribe. Often missed and can increase your good standing with Google if you add alt text to all your images. Alt Text provides a text alternative for an image. The text is displayed instead of an image, say in email or if the browser does not display images. Google loves Alt Text because it tells Google what the picture is about and also improves accessibility of your website. WordPress allows you to easily add these in the Media Library when you add each image – just add the text that you want to appear for your Alternative Text, in the box on the right hand side. If you are new to blogging or have a blog and don’t utilise it to its full potential please get in touch and we can discuss how we can help 01904 863511 or email info@pickandmixms.co.uk.